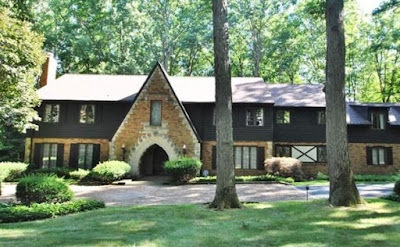 When talking or writing about Tudor Revival homes here in The States, it’s clear that in terms of quality, they clearly run the gamut—from beautiful and authentic-looking examples like Akron’s Stan Hywet Hall, to decent-looking suburban homes, to less-convincing modern interpretations—and then to what can only be considered abominations, like a Tudor ranch or split-level. Whatever type you might happen to encounter, it’s best to always be ready for a surprise. So it was on a recent winter Sunday. There being no football (it was the week before the Super Bowl) the wife asked if I would go with her to look at some very large “open houses” for sale on the other side of town. Once in a great while, we do this for pure entertainment—or what I like to call “shits & giggles”—to see what is out there on the market and perhaps collect ideas for our own home. All of the homes we visited were significantly larger than our present home, and about three times as costly. None were really practical for us, since investing in a far larger house at a time when most couples are getting ready to downsize for retirement doesn’t make sense. Nevertheless, we got in the car and headed out. Only two of the homes we visited were really worthy of note; both were Tudor Revivals, and both had both good and not-so-good elements that caught my eye. They were built almost 20 years apart (1971 and 1988) and both had some interesting stories to tell. Not a bad looking house at all - considering it's a relatively recent effort. The first of these houses I remembered quite well, having seen it well before I built my own house in 1992. The exterior is in excellent shape after almost 30 years, and I must say that in terms of overall design and massing, it is one of the better Tudor Revival-style homes I have seen built in recent times. The roof pitches are fine, the half-timbering work is reasonably robust—not thin and chintzy like so many other recent examples—the plan is angled and irregular, and the stone and brickwork is competently done. Parts of the second floor are even jettied-out over the ground floor, which is also nice to see. It is not perfect. The house could stand some more detail in the timberwork. The windows are a little too tall, and feature a combination of both square and the cliché diamond-pattern grilles that are always too large and out of scale. Worst of all, they are all white, when they should be the same dark brown as the timber. The overhanging jetties also lack any corbels at the ends or other supporting structure, which gives them a stark and unfinished character. Overall, the exterior provides an example of a fine, custom-built house (I would assume the work of an architect) that could have greatly benefitted from a little more care and research. I think a lot of American designers use houses built in the 1920’s and 30’s as traditional design guides, instead of resourcing original English examples or even old pattern and style books, like Garner & Stratton’s Domestic Architecture of England during the Tudor Period. The result is often a loss of detail and in less adept hands, some clumsy or incomplete results. The good thing about the exterior of this home is that it could be easily remedied with a few additional elements. As solid as the exterior was, the interior featured little if any historic detail. There was plenty of brown oak, yes, and a nice arched front door—but inside I found the traditional-style woodwork you’d see in any nice home; a spindly staircase with thin balusters and a curled volute newel detail at the bottom and the ubiquitous six-panel colonial doors. Where one might have employed a Tudor arch, or even a curved arch over a wide doorway, the builder had substituted rather crude-looking openings with the upper corners cut and cased at a 45-degree angle. The home’s fireplaces were either stone or brick, but were utterly plain and ordinary, and could have been found in almost any home. There were some nice built-ins and storage, but nothing extraordinary, though the master bath did have some very fine English-style cabinetry. One interesting feature was the slim doorway/balcony in the master bedroom that overlooked the two-story great room—a historical nod to the “squint” or “chaperone” window found in many ancient Tudor homes. The way the cased opening here is handled leaves a lot to be desired. All in all, for about $650k it was still a very nice house on a large and attractive treed lot, but one that deserved a little more attention in terms of detail. I was thinking another $50k of proper detailing and upgrades could bring it into line. I found the other Tudor Revival home on our tour to be a great curiosity. My first impression was that someone had taken a rather straightforward two-story colonial home and tacked a brick Tudor-style entry porch onto the façade. I see this feature on a fair amount of Tudor Revival houses, both new and old—when the entry roof pitch is too steep, it borders on the cartoonish. This one was a pretty close call. The front was extended a little to the right, ending in a long side-entry garage featuring a second story with shed dormers. The windows were too large for the style. From the street, it did not appear to be such a happy composition. One of the only houses I've seen that looks better up close than at a distance. Going up the driveway and standing up close, however, I found the overall effect to be far more pleasing. Closer inspection revealed that the ground floor was clad in fine, old-style brick all around—the same as on the high-peaked entry front. The upper story was covered in rough clapboards, but the edges were cut in a wavy, irregular style and finished in a very dark, almost black stain. The stonework around the entrance was very fine as well, and the doorway was flanked by some very large, black iron torchieres that looked like they were a hundred years old. Clearly, whoever selected the materials knew what they were doing, because the resulting combination of colors and textures felt very natural and appropriate. Remember, this was a 1970’s house. I didn’t expect much from the interior other than harvest gold Formica and tired, avocado carpet. I was right on that count, and the furniture still in the house was from the same era. It was almost like a time machine. But here again, there were many surprises. There were beautiful, authentic plaster details found throughout the house, and best of all, they were actual Tudor designs, including a splendid mantel, excellent cornice and crown moldings, ceiling medallions—each one looked like it had been picked out of a 1920’s catalogue. The doors were solid wood, and were of the appropriate 8-panel Tudor-style. Some of the rooms featured coffered ceilings or peaked ceilings with beams, and a couple of the bedrooms combined that with walls paneled in wide, hardwood boards. I had mixed feelings about the foyer stairway, it was broad and curving—and open to the basement level as well as above. Rather than wood, the stair had a curved iron railing, which would probably look much better if refinished in black rather than its current funky 70’s gold. Removing the carpet on the stairs would help too, I am sure. Then again—there was carpet just about everywhere; being a 70’s house, I wondered if there was hardwood underneath any of it. The kitchen and bathrooms all needed to be re-done. The fixtures and cabinetry, while clean and in very good shape, were old and outdated. The house even had an elevator, and the Realtor whispered to us that there was a secret staircase that went from the owner’s suit up to the attic and down to the basement. A secret staircase! How Totally Tudor of them. Exterior aside, I left that house being quite impressed by the attention to detail and high standards of the original builder and owner. Though the exterior elevation left something to be desired, some of the interior details were totally unexpected. I can’t imagine many of the architectural products were commonly available when the house was built—as Tudor homes were seriously out of style in 1970. They must not have been that easy to source. Even today, with the help of the internet and its worldwide reach, it’s not always so easy, as I have noted previously. Now if you combined the exterior design of the first house with the attention to detail of the second house, you'd really have something. As I said, always prepare to be surprised.